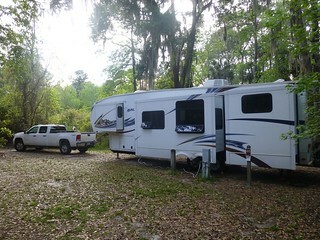 I was sad to leave Florida but when we arrived at Skidaway Island State Park in Georgia I was very pleasantly surprised. It was a beautiful park with trees covered in Spanish moss. It made me think of a drier Dagobah…where Yoda hung out. We had reservations but you still pick out your spot so we drove around the park and there seemed to only be two options unless we took a handicapped spot which we didn’t want to do. So we picked one and got settled in. What a gorgeous place!!! This place is still on my mind and possibly one of my favorites on the trip! It’s quiet and absolutely beautiful! Instantly I wanted to take a picture of our “yard.” This park is definitely worth visiting if you are in the area. There is so much to see and learn about in a small area. They have great (short 1.5 miles or less) trails. The trail maps give great info about the plants, trees and history of the area. All the trails are worth exploring. The only downside is it’s about 30 minutes to Savannah and Tybee Island. 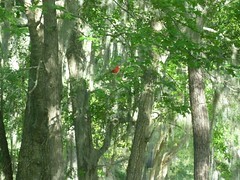 Immediately we noticed the cardinals that like to hang out in our front yard. Also the pileated wood pecker that liked the trees in the back yard. Since it’s a state park we of course asked for the Junior Ranger book. 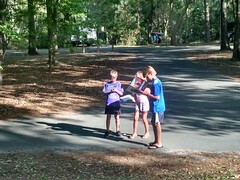 Cranky kids meant I sent them out right away to get some fresh air and work on their Jr Ranger books. Mama needed peace and quiet. We woke up to a pretty dreary and slightly windy day. But we didn’t let that stop us. 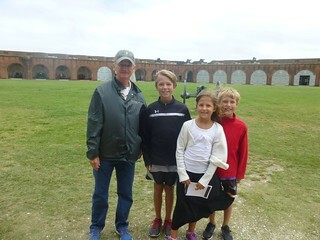 With a lunch packed we headed off to Fort Pulaski National Monument to catch the 11:00 tour. We arrive in the nick of time. The volunteer giving the talk was named….ah crud, we never did ask his name. But this fella was a story teller and he did it in a style where he took us back in time and made us feel like we were part of the action. He got so into taking us on a tour of history and the fort that he ran out of time and had to speed through the last little bit. But he hung around for questions of which we had a few. 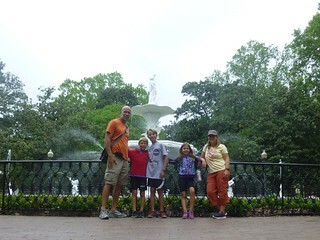 After our very long stay in Florida we moved on to Georgia. But only for a few days. 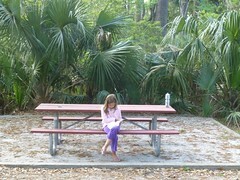 We headed straight to Skidaway Island State Park just outside of Savannah. 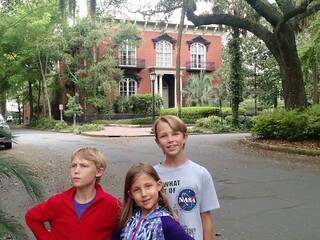 Our first day out we spent the day in downtown Savannah. I really liked the historic area. The squares were beautiful and plentiful…every couple blocks there is another one. Not that I know anything about it but I like the architecture. Living in an old house myself (our sticks and bricks) I guess I’m partial to older buildings. The weather was perfect the day we were there; not too hot, not too cold.